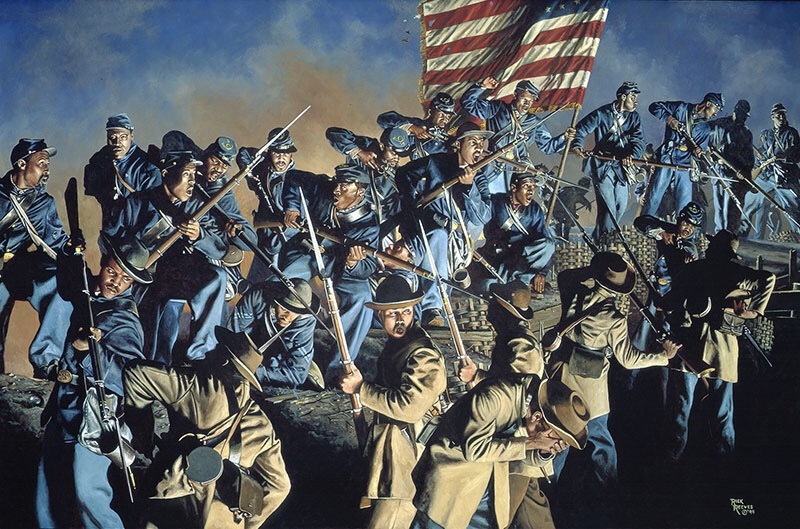 One hundred and fifty-four years ago today one of those African American regiments went into action against the Confederate works at Battery Wagner, outside of Charleston, South Carolina. The 54th was raised in Boston and Frederick Douglass was instrumental in recruiting men to serve in it, two of which were his sons, and another the grandson of Sojourner Truth. 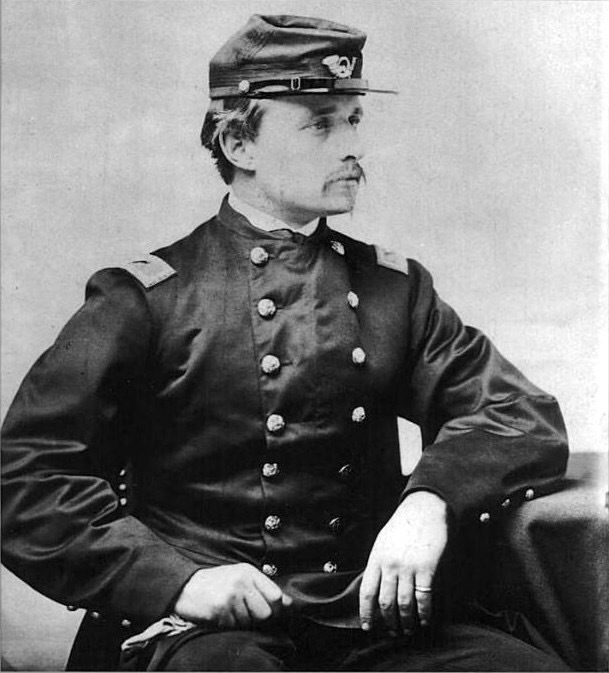 The regimental commander, Colonel Robert Gould Shaw was the son of wealth abolitionists. When the call for volunteers was made in 1861 joined the 7th New York, and later commissioned in the 2nd Massachusetts Volunteer Infantry, with which he fought at the battle of Antietam. After that battle he was offered the command of a black regiment then being raised in Boston. He initially declined the offer but on second thought decided to take it. Later tonight I will probably watch the film Glory about that regiment, the 54th Massachusetts Volunteer Infantry. It was one of the first African American Regiments raised for service in the Civil War. I have seen the movie a number of times, and it never fails to bring tears to my eyes. Of course I have written a number of articles about the 54th and other African American units in the Civil War, the later “Buffalo Soldiers” and African American military pioneers, but I cannot forget the 54th. These were men who volunteered and remained in service knowing that the Confederate Congress had condemned them to death should they ever be captured. They also endured the mocking of some White Union soldiers as well as pay inequity with whites, for doing the same dangerous job as infantrymen. During their attack on the night of July 18th 1863, 272 members of the 600 men of the 54th who made the attack including their commander, the twenty-six year-old Colonel Shaw were killed or wounded in a bloody but unsuccessful assault on Battery Wagner. 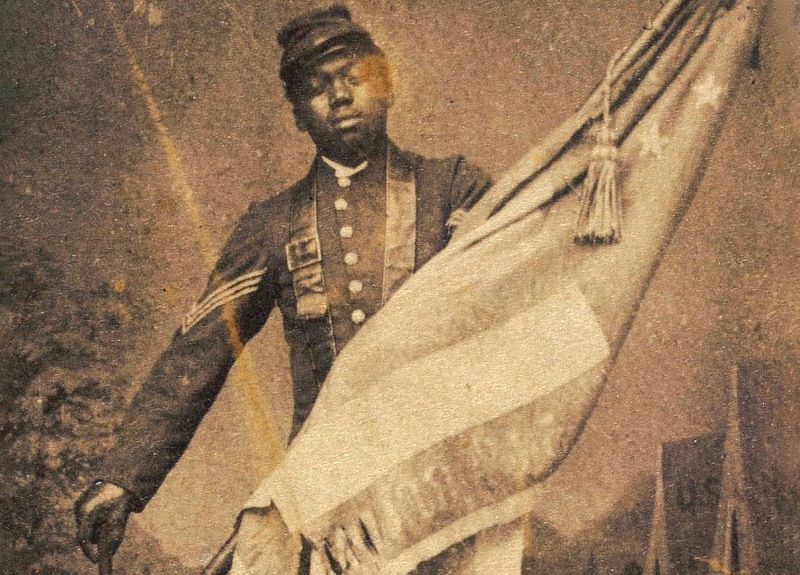 Following the assault, “Sergeant William H Carney staggered back from the fort with wounds in his chest and right arm, but with the regiment’s Stars and Stripes securely in his grasp. “The old flag never touched the ground, boys,” Carney gasped as he collapsed at the first field hospital he could find.” He would be awarded the Medal of Honor for his actions. That is what we fight for when we stand for the civil rights of others. That is why it is important to remember the example of the men of the 54th Massachusetts Volunteer Infantry. Many years ago my Dad and I watched the movie Glory together. At the end of the film our eyes glistened with tears. My Great Great Grandfather William Henry Halstead served with the 29th Colored Regiment CT so Glory has a special place in my heart. Descendants of the 54th and the 29th have gathered together many times to honor our brave ancestors. It was an excellent film and reminded us of our duty towards others, even those different from us.It seems the Confederacy is still alive and well and in favour of slavery though these days I think it will also accept whites in that position since there’s a move to keep the poor as they are, but poorer.